As we roll out the first phase of language options and add new Test Features, please try them out and give us feedback! If you have feedback for the language options, please follow this link to our form. 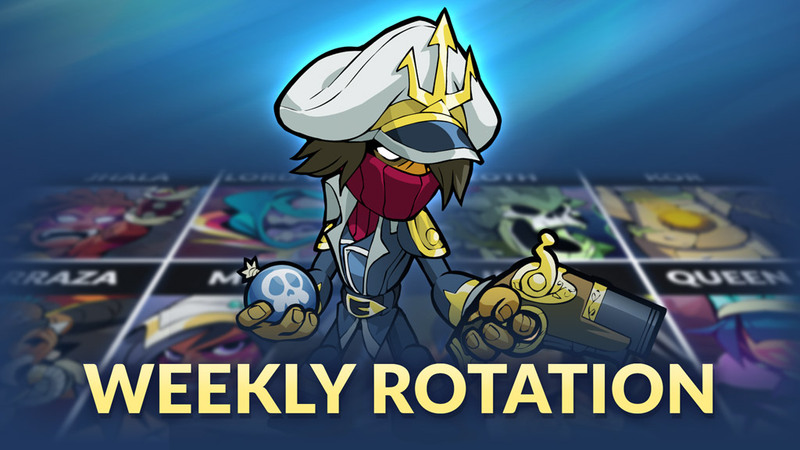 This week we’ve changed the Brawl of the Week to KO Mania, changed items on sale in Mallhalla, and updated what Legends are on the free-to-play Legend rotation. We’re excited for this roll out, so please try it and give us feedback at this form! On PC, we are rolling out the first phase of language support. Some of the main portions of the game are now available in: Chinese (Traditional), Chinese (Simplified), French, German, Italian, Japanese, Brazilian Portuguese, and Spanish. To select a new language, go to Options > System Settings. We’ve added a new feature where you can hide the match timer in Stock matches until there is 1 minute remaining. Try out the option and let us know how it feels during gameplay. We’ve added a new Warshuttle map to the Experimental Map queue! Try out the map and let us know how it feels. For more information, visit brawlhalla.com/test-features. For a limited time, the Sunken and Cosmic Chests are available with exclusive Skins! Square off against your opponent in this hard hitting KO fest! Chew through your foe’s 5 Stocks with damage cranked up to an insane 300%! Send your challenger into orbit before they know what hit them. First to 5 KOs wins! 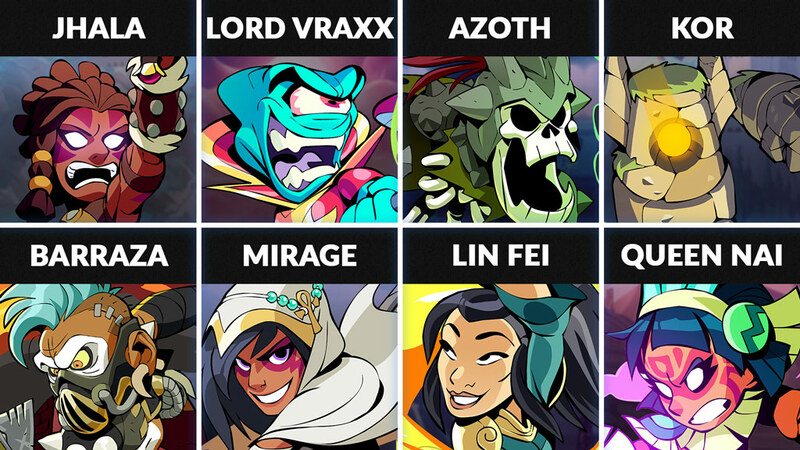 The new Legend rotation for this week includes: Jhala, Lord Vraxx, Azoth, Kor, Barraza, Mirage, Lin Fei, and Queen Nai. Jhala – Given the title “Exalted Lion” by Apollo himself, Jhala “The Unbroken” takes the glamor of Valhalla in stride while having fun slaying her foes with Axe and Sword. Lord Vraxx – This feared warlord dominates his opponents with Rocket Lance and Blasters! Kor – Blackguard Keep’s left platform mover takes his place in the arena wielding both Gauntlets and Grappling Hammer. Barraza – A feared man in the wastelands with his Blasters and Axe, Barraza is the ultimate survivor and will do what it takes to be at the top in Valhalla. Queen Nai – With each victory nourishing the gods of her people, Queen Nai has come wielding Katars, Spear, and her powerful sorcery.